Alternative sites and found materials will inspire sculptural studies in space. Students will create large-scale works that respond to their site with a “leave no trace” philosophy. Works will be documented by the student using photography and/or video. 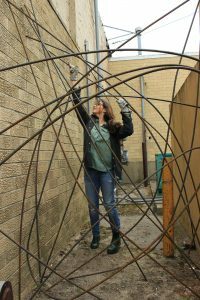 Informed by contemporary approaches to installation and environmental art, the student will develop forms and methods that embody their concepts while expanding their awareness and experience of space. Instruction is provided on an individual basis.